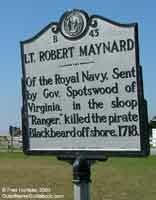 Historic marker on Ocracoke, located near the ferry dock and old Coast Guard Station. 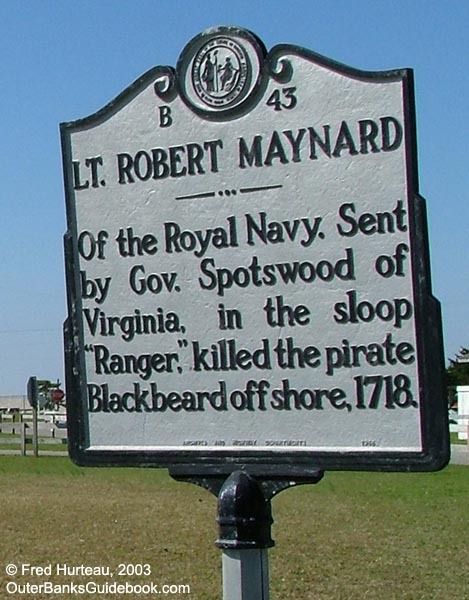 History and legend go hand in hand on the Outer Banks. 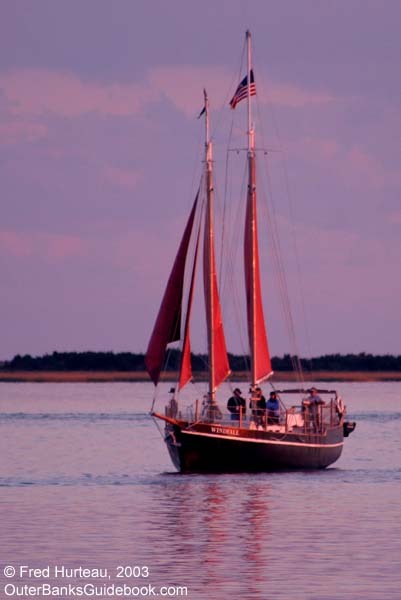 Weave in some ghost stories and mysteries, pirates, shipwrecks and unselfish bravery, and you have the fabric that makes up the folklore of the Outer Banks. 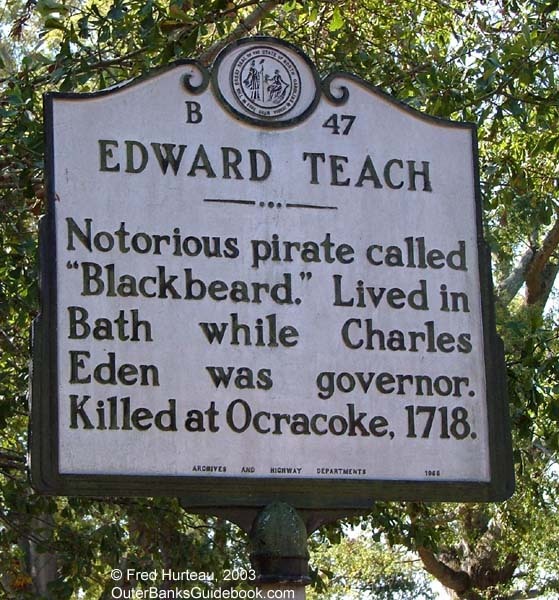 There is history surrounded by legend, not the least of which is Blackbeard, whose mark is all around the coast of North Carolina, from Bath, to Beaufort, to Ocracoke and beyond. Ghost ships and mysterious sightings, and other tales live on of dreadful fates of shipwreck victims spawned by the truth that is the "Graveyard of the Atlantic". Magical, mystical tales, such as those told by superstitious men of the sea, weave their threads into those stories of the crews of the Life-Saving Stations, whose fearlessness in the midst of deadly storms is factual, recorded history, now become legend. With such a wealth of material to draw upon, how do you decide what can be highlighted in the space of a web page or two? Certainly it is not easy. 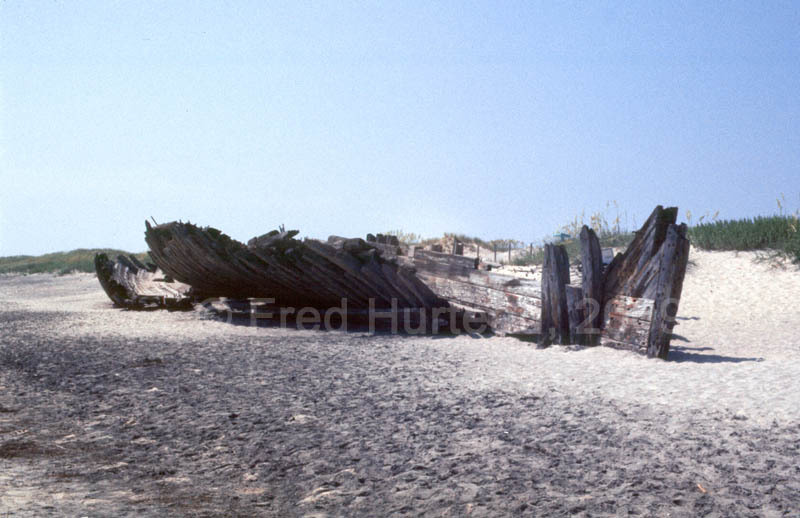 Books such as Charles Harry Whedbee's "The Flaming Ship of Ocracoke and Other Tales of the Outer Banks", and his "Legends of the Outer Banks" provide good reading on many of the less widely known stories. Here though, the aim is to entice you into looking further into it for yourself. 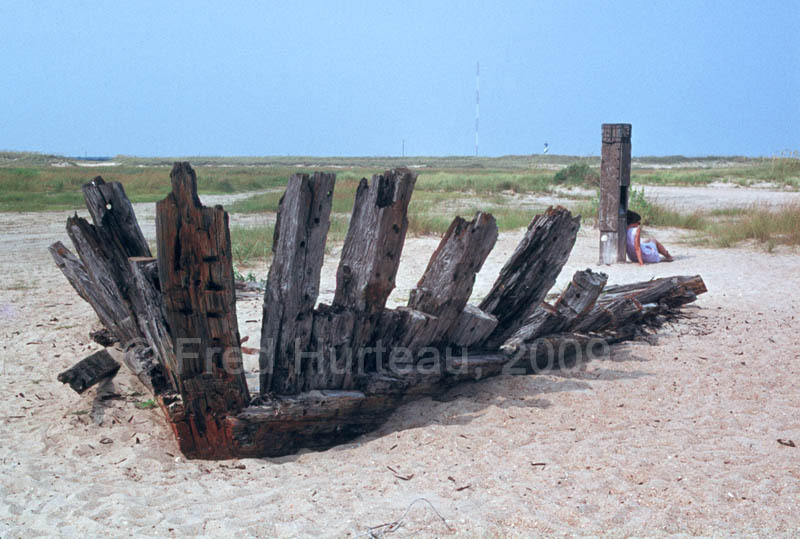 Wreck of the "Altoona", Oct. 22, 1878, at Cape Point, Hatteras. 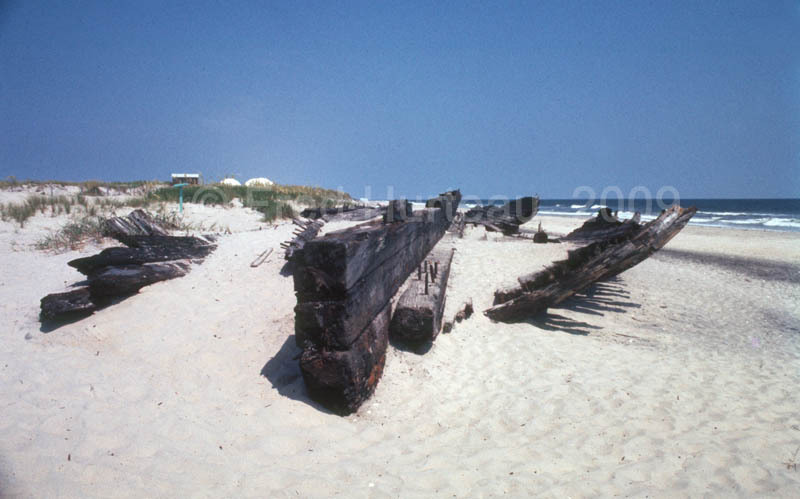 Thirty years ago there were more wrecks visible onshore than there are today. Time and storms have taken their toll. 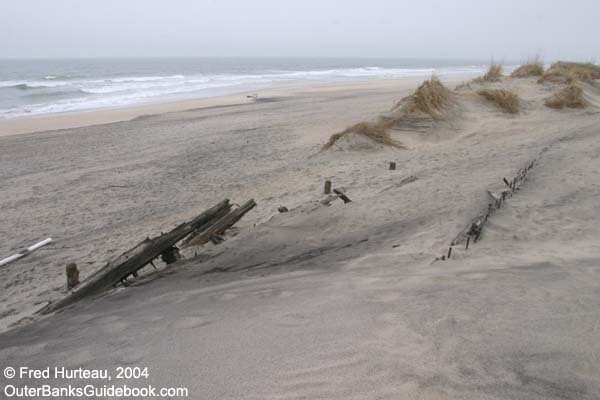 Wrecks get washed ashore, then covered by sand, then uncovered in storms, and covered again. Over the years they get moved by storms, as well as broken apart and scattered. 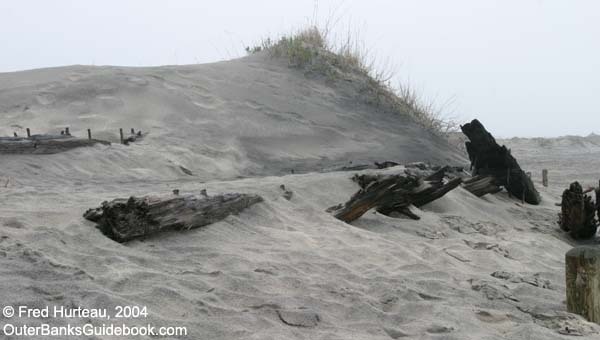 On the beach - stationary - gets covered and uncovered by sand and/or high tide. 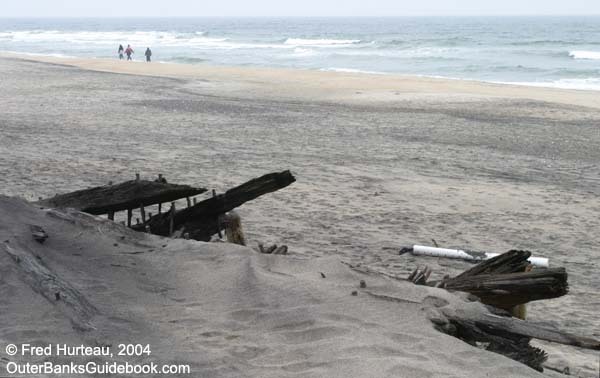 May include the notation - Visible "often" or "rarely"
Locating the remains of shipwrecks on the Outer Banks is not necessarily as easy as the tourist pamphlets, travel brochures and other web sites might imply. 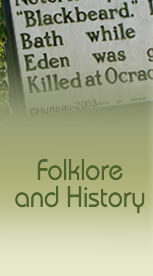 Many or most of the brochures, and especially the web sites are publishing inaccurate and out of date information. 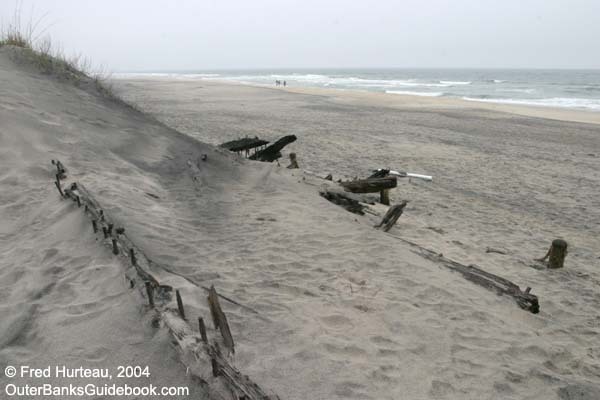 Some even publish locations using beach ramp numbers that no longer exist and were changed by the park service over a decade ago! 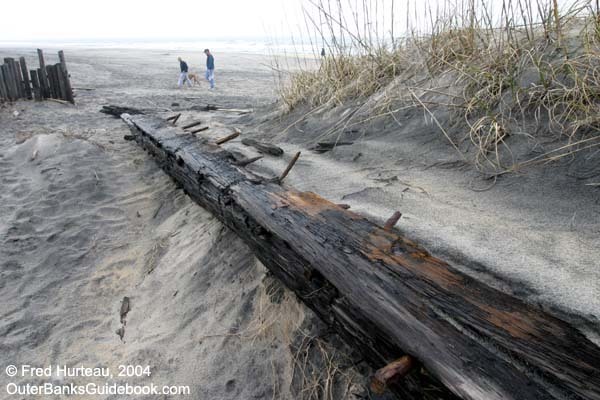 Of course, we are talking about wreck sites which are on the beach, in the surf or near shore where they are visible and accessible to the average visitor. There are also underwater wreck sites, which require scuba gear and experience to reach. Other web sites are devoted to this interesting sport activity, but that is not within the scope of these pages. It is important to remember that it is illegal to deface or remove any wreckage or pieces thereof located on U.S. Park Service land. 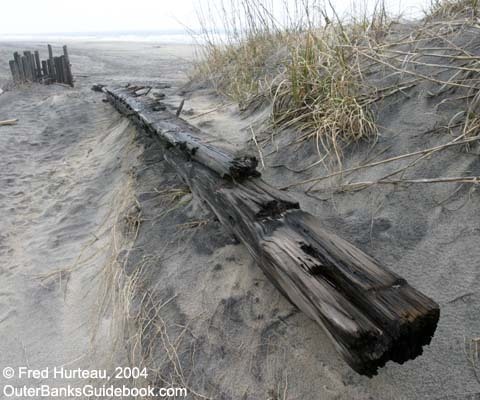 Please keep in mind that many of the smaller pieces of wrecks listed in these pages either are moved around by the storms and tides, or are covered and uncovered randomly at the whim of nature. These are virtually impossible to keep updated, and more often than not, will disappear within days or weeks of being found and recorded here. 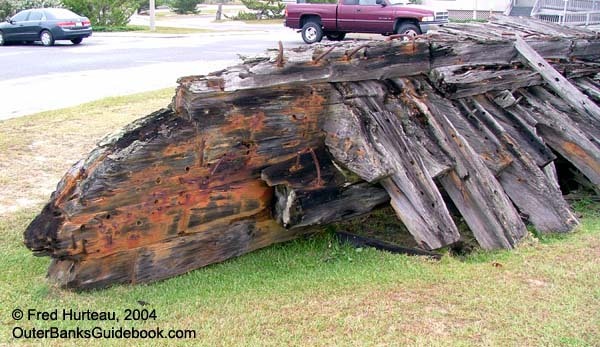 Most in this category are labeled as "Unknown Wreckage" with an ID in the "UNK-#_date" format. If it has a name (example- the "Laura Barnes") then it's probably been stuck for decades right where it is now. Unless otherwise noted, these are the sites you can actually expect to find. Remember though, even these can be covered and uncovered by sand. They just don't get washed from place to place. 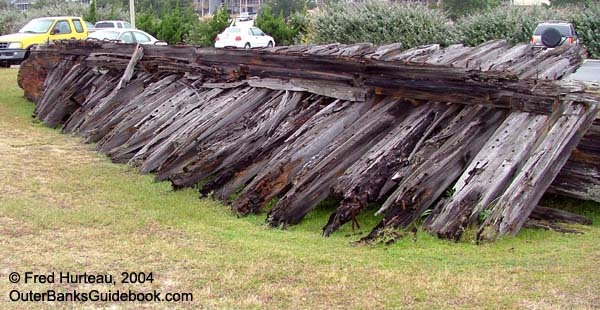 The fun part is that if you do go looking, you might find another site of wreckage all on your own. 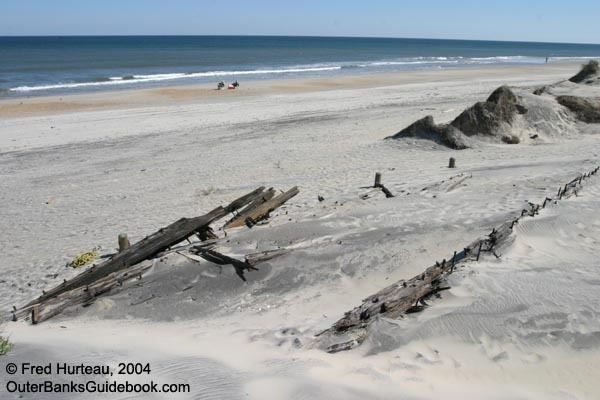 Directions for finding these sites are noted by using 4WD beach access "Ramp" numbers (How to find Ramps) and the mile markers along NC Highway 12 on the Cape Hatteras National Seashore, which look like the example at right. Watch for them. For those of you with GPS receivers, we also provide GPS coordinates in the Decimal Degree format (hddd.ddddd°, also called dd.dddd°). If you need to convert them to other formats, click here for some handy conversion pages. For those of you with Google Earth installed on your computer (it's a free download, by the way) you can download our .KMZ file and go to any of these shipwreck sites virtually. How to find it: The entrance to Nags Head Town Hall complex is at the base of the Nags Head water tower, easily found on the east side of US 158, south of Jockey's Ridge and north of Whalebone junction. Turn east into the town hall complex entrance, marked with a sign. The shipwreck is in the grass median in the middle of the parking lot. There is an interpretation display which features four newspaper articles about the wreck. At right is an aerial view of the location. 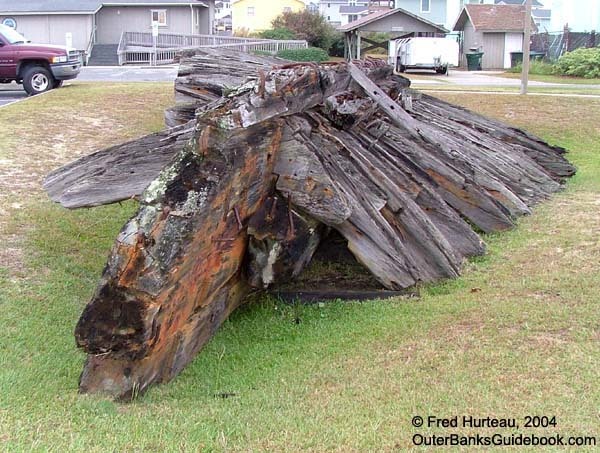 The Frances E. Waters sank in October, 1889. 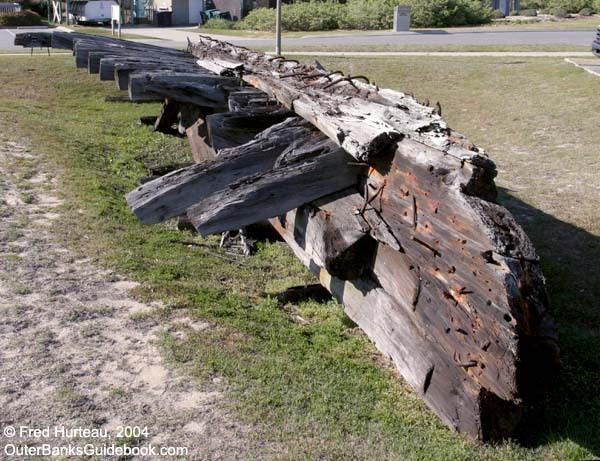 It sat on the beach at Nags Head until a storm in May of 1978 picked it up and floated it southward, crashing through Jennette's pier, cutting the pier in two. 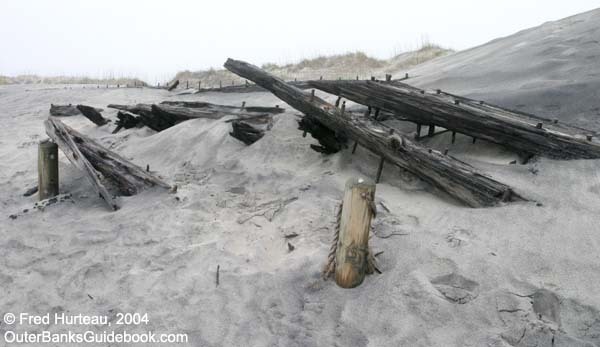 The storm then carried the wreck south to Oregon Inlet. The city moved it back to Nags Head to rest outside city hall. The photos at right and below, added in October, 2004, were taken on a cloudy day to minimize deep shadows, and may show a bit more detail than the set above. Location: Coquina Beach - Cape Hatteras National Seashore. Coquina Beach entrance is located on NC Highway 12, exactly across from the entrance road to Bodie Island Lighthouse. How To Find It: Coquina Beach is on NC Hwy 12, south of Whalebone junction/Nags Head, and north of the Oregon Inlet Bridge. The entrance to Coquina Beach (and Bodie Island Lighthouse) is 7/10 mile south of mile marker 22. Turn east off the highway, park in the parking area, and walk north to the bath house/restroom area. The boardwalk from the bath house takes you over the dunes to the beach. 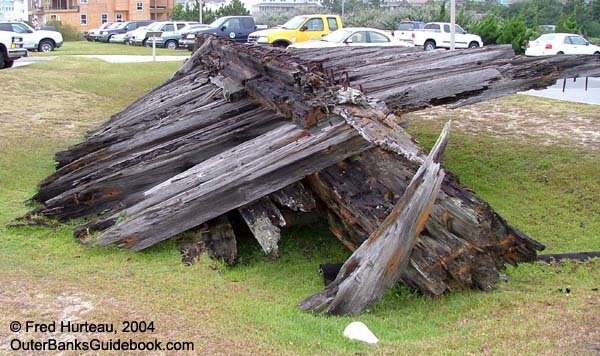 Immediately at the end of the steps down to the beach you will find the remains of the Laura A. Barnes. The aerial photo above right shows the parking area, bath house, boardwalk and the wreck site. Above: the view at bottom of boardwalk steps The Laura A. Barnes sank in 1921 at another location. It was eventually moved to it's current location at Coquina Beach for public display. Compare these multiple views in the two columns at left, taken in April, 2004, with two photos taken in 1973 (below). 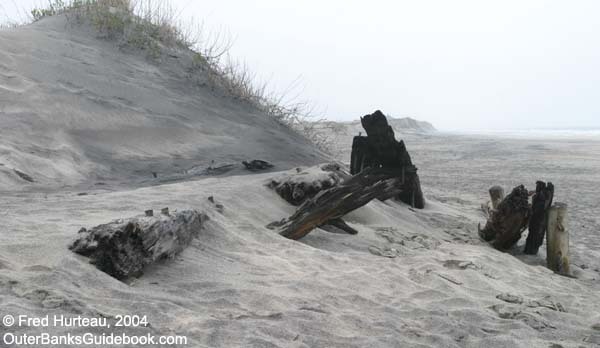 It was already partially covered by sand in 1973, and eventually became hidden from view for many years. 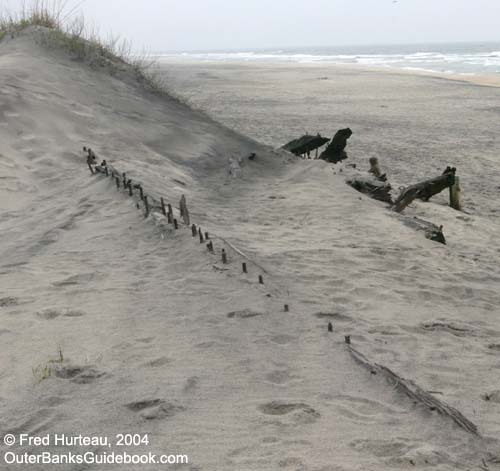 In September of 2003, Hurricane Isabel eroded away some of the huge dune which had built up over it. Once again parts of the wreck are visible. Back in 1973 it had already been vandalized many times, and set afire as well. Evidence of the fire is still quite obvious in some of the 2004 photos, especially this one. The photos above were taken in April, 2004. 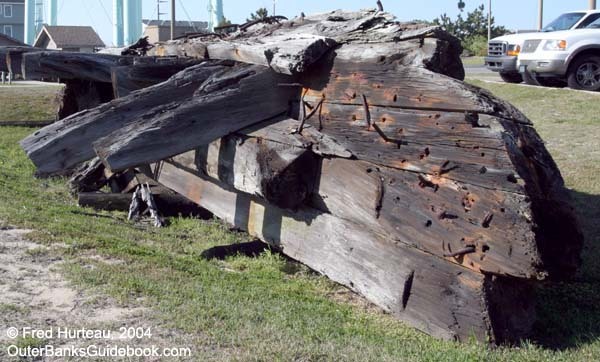 The L.A. Barnes wreck was visited again in October of 2004 to see what changes had occurred during the extremely busy 2004 hurricane season. Compare the two images below, and the two images at right, taken 6 months apart from similar angles. 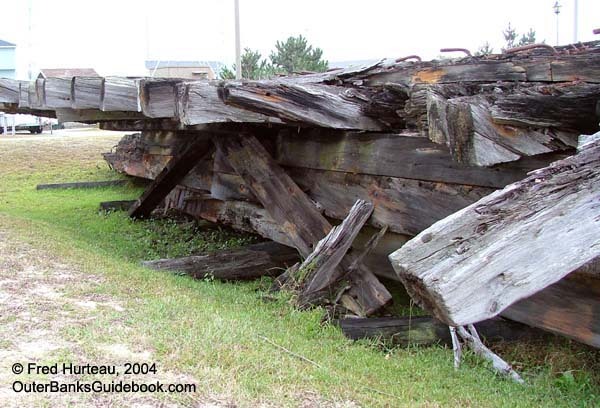 It can be seen that a bit more of the wreck is visible in the later October images. 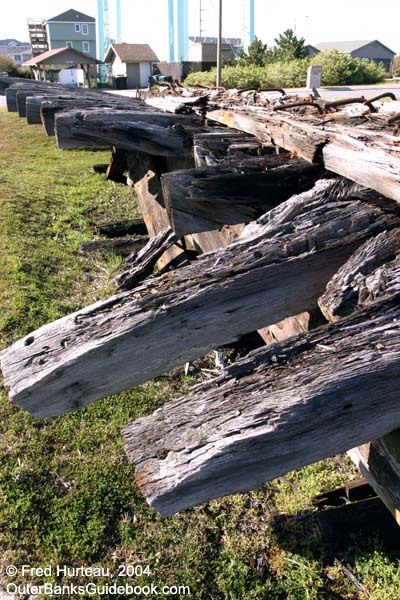 There are many more shipwrecks to see.